What does it really take to win the CRM game? Specifying your CRM Implementation Project Requirements, and honing in on the details! To do this, you first need to make a list of your current processes. This can be done at any point in time, so if you know your company is planning to implement and adopt a CRM Solution in the next few months or weeks, you can start now. You don’t have to make a flow chart or fancy diagram; just know what they are. A simple list works just fine! Document your processes in a way that makes the most sense for your business. Identify what your problems are, and stimulate conversation among your team members to set yourselves up for CRM Project Implementation success. 1. Which processes are taking too long? How will CRM help to shorten or simplify these processes? Consider the possibilities of increased efficiency with your CRM solution. Specify requirements around which processes need to move faster through your sales cycle. 2. Which processes do Users complain about or simply not do? And why are they not doing them? Is it a technical malfunction that will be resolved with CRM, or how will you as a manager ensure this process is adopted with your new CRM system. Specify the requirement of how you anticipate this working in CRM to help reinvigorate and re-engage your Users. 3. Which processes do not add value? Are there some processes that you don’t need to add to CRM or should rid of altogether? Specify requirements for which processes definitely need to be added versus those that don’t. 4. Which processes seem inefficient or are too manual? Don’t be afraid to rewrite some of your processes with your new CRM solution. Things should become easier in the long-run with it. Specify requirements around processes you want to add more personality behind or be more efficient with. 5. Which processes are too complex? Determine which processes can be simplified in your new CRM Solution. Consider how simplification can open your team up to new opportunities with your newfound CRM capabilities. 6. Which processes just don’t make sense? If you and your team are all astounded at the way your organization has been doing something, it’s time to change it up! Make sense of non-sensical processes, or eliminate them altogether, whatever is best for your organizational needs. Specify how this process will be replaced in CRM or specify why you no longer need it. 7. Which processes are the most important? Which processes can’t you live without, and how will they translate into your new CRM Solution? Specify these essential processes and how they will work with your new solution. Are you ready to learn more about what makes a successful CRM Implementation? 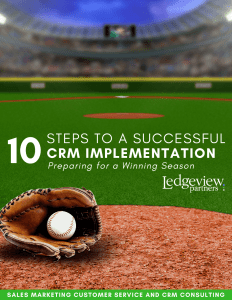 Get Ledgeview’s new eBook: “10 Steps to a Successful CRM Implementation: Preparing for Winning Season” here.